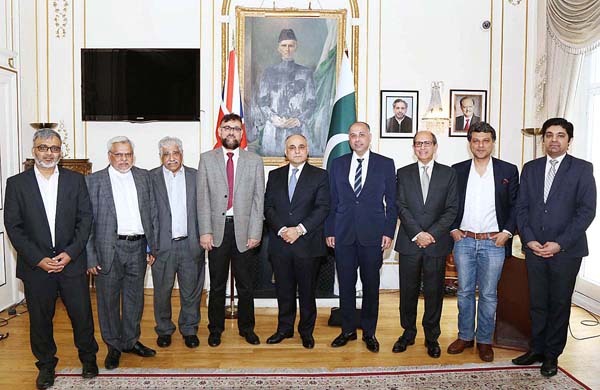 Abbas, Pakistan High Commissioner to the United Kingdom (UK) here on Monday and discussed various key initiatives undertaken by their organization for the provision of better health services in Pakistan. The delegation was accompanied by Sajjad Karim MEP, who also supports the network. committed healthcare professionals, entrepreneurs and philanthropists, which changed the dynamics of healthcare system in Pakistan. patients from all over Pakistan, said Dr Bari. The high commissioner in his remarks commended the philanthropic spirit of Dr Abdul Bari and his entire team. He said health sector of Pakistan needs more such networks as IHN to cater the health needs of our growing population. The high commissioner called upon the medical fraternity of Pakistan working abroad to get together on a single platform and serve the country. Pakistan visas to health professionals on the recommendation of the network. He further offered that the network could hold their events at the Pakistan High Commission, London. The high commissioner appreciated Sajjad Karim MEP for his support to the IHN’s initiatives. has been expanding its services by launching secondary and tertiary care hospitals. In the year 2016-17, the Indus Health Network emerged with 11 secondary and tertiary care hospitals across Pakistan. The delegation informed that some of IHN hospitals were managed and financed by the network itself and some were only managed by the network under the umbrella of public-private partnership. are as important as the provision of quality treatment. To cater to this need, the network established family medicine clinics and launched a large number of public health outreach programs across 41 districts of the country. Other members of the delegation included Karim Paracha, Ibrahim Jamali, Anwar Zaidi, Mukarram Sattar, and Faraz Khan. treated per month (July 2017-Feb 2018) Since 2007 more than 6.7 million patients have been treated. in 2013 that mobilized the nation towards 100% voluntary blood donation; provision of safest possible blood screened on international standards. ICRC and Chal Foundation to provide prosthetic & orthotic devices while for providing children cancer services, the largest children cancer oncology unit was established in Pakistan. Regarding the Disease-based outreach programmes, they said that a “Aao TB Mitao” (Come and eliminate TB): programme was also initiated and scaled up through collaboration with National TB Programme of Govt of Pakistan & private sector stakeholders; funded by Global Fund for AIDS, TB & Malaria, TB REACH & donor agencies. To date, they said 1.7 million patients have been screened for TB through the programme. Pakistan, while under HIV programme which was started in December 2016, focusing on scaling the programmatic management of PWIDs affected by HIV.